For many young people, a pair of headset is one of the daily life equipment which can’t be lack of. Whether it is on the road trip, or on the way to work, just come up with headphones to listen to music, and this always gives people some spiritual dependence sense. Compared with ordinary wired headset, the emergence of Bluetooth headsets helps people get rid of the constraints of headset lines. Especially for regularly going out friends, a pair of Bluetooth headphones is undoubtedly the best choice. Today we will experience the HAP-1 Bluetooth Neckband Headphones. As an in-ear Bluetooth headset, the design and lasting time of HAP-1 are of many advantages, not only to meet the daily needs, but also can be used as a pair of sports headset. Here we take a look at this pair of headset suitable for all-day use. First of all, the packaging design of HAP-1 is very simple, in front of the overall shape of the headset showing the back of the headset and back introducing the main features to facilitate the understanding of the headset. In the upper left corner of the package there is a "Smartomi" Logo. From the headset design we can see that HAP-1 tends to be a more sports style, and the bare metal weight is only 0.6 ounces, nearly no sense of weight. HAP-1 Bluetooth headphones with mic adpot rear-mounted design so that the users can hang them directly on the necks. Through the headset line clip they can also adjust the length of the headset to adapt to the needs of different users. Outside of HAP-1 Bluetooth headphones we use magnetic button design for customers to attach to the chest after adsorption. Not only are they practical and do look very beautiful, but also there will be no need to frequently remove the headsets, compared to a lot of wired headset facilitates more convenience. Of course, it can also prevent your headphones from accidentally missing. 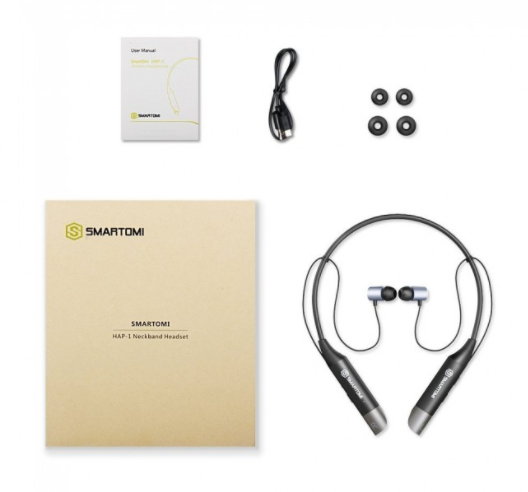 After being simply taken out of the package box, remove the HAP-1 Bluetooth headset, and we found that this pair of headset is with patented double earplugs, and its biggest advantage is that it can attach ear canals for wearing more comfortable, also playing a better sound insulation, even when in a noisy environment songs quality will not be affected. According to the research, HAP-1 Bluetooth headset is with CVC 6.0 Noise Cancelling and APT-X HD Stereo. The wire is characterized with rugs and good flexibility. When you go out, you can put the headphones in your bag, and you can listen for up to 14 hours on a single charge. It can also be installed in your pocket. Of course, you can use the portable storage bag coming with the package.